Spring training is in full effect for many out-of-season athletes. As the weather begins to warm, it’s important to remember to fuel your body properly for the intensity of off-season training and to prevent injury. Proper nutrition before, during, and after training is important. TIP #1: Hydration is key! As the temperature and humidity increase, so does your need to hydrate. Since your muscles are 75 percent water, both fluids and electrolytes are important to achieve optimal hydration and prevent performance deficits. Since hydration is cumulative, you want to focus on hydrating all day long. Before and during training, water or sports drinks are the best choices. After workouts, low-fat milk provides both fluid and electrolytes, as well as carbohydrates and protein, making it an optimal hydration beverage. TIP #2: Protein will keep you strong throughout training. According to the American College of Sports Medicine, the recommended daily protein intake for athletes is 1.2-1.7 grams of protein per kilogram of body weight. They emphasizes that the timing of protein consumption is also relevant. Consuming protein before strength training will provide the amino acids your body needs to begin the repair process immediately. After training, protein will continue to support muscular repair and ensure optimal recovery and muscular development to keep you prepped for tomorrow’s workout. High-quality, milk-based protein like the kind found in low-fat chocolate milk, cottage cheese, string cheese, and yogurt are especially beneficial for mitigating lean mass loss and promoting muscle gains. TIP #3: Carbohydrates provide the energy you need to finish your workout. If you compare your body to a high-performance vehicle, carbohydrates are the fuel for your engine. They keep you going for extended periods and provide the benefits you need in the off-season to become a better athlete in-season. Most athletes need about 5-8 grams of carbohydrates per kilogram of body weight daily, and about 8-12 g/kg during long duration workouts or heavy training periods. Having a steady dose of carbohydrates in your diet will keep your muscles fueled and your body prepared. The most nutritious sources of carbohydrates are dairy foods, whole grains, fruits, and legumes. 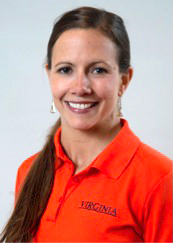 Kelly Rossi is the Associate Director of Sports Nutrition at the University of Virginia (UVA). She works with a variety of men’s and women’s sports at UVA. Before arriving at Virginia, Rossi worked with the Office of Naval Research (ONR) as a contractor, supporting research in Human Performance, Training & Education related to Marines.